Receiver doesn’t look like much, but it makes you see things you think you know in a very different light. I have fired off millions of rounds in games over my gaming life. I have killed some number of virtual people that’s perhaps in the region of one tenth of that. I have gone to a real life shooting range twice and discovered I’m a pretty good shot with a pistol. I also discovered that the gun is a tool that you need to learn how to safely opeate. Receiver is a game that brings these two separate things together. Astonishingly, as far as I know it’s the first game to take this approach. It’s simple, more a toy or an experiment than a game, really: you’re given a random gun out of a couple of different models and tasked with finding a set of randomly hidden tapes in a randomly created building. A group of robots are on watch, out to kill you on sight. A single hit kills you and resets your progress. This game part of the whole is not very interesting nor good – the game was created in seven days and this is where it shows. The point of Receiver isn’t that game. The point is what you’re doing in the game, which is operating a gun. 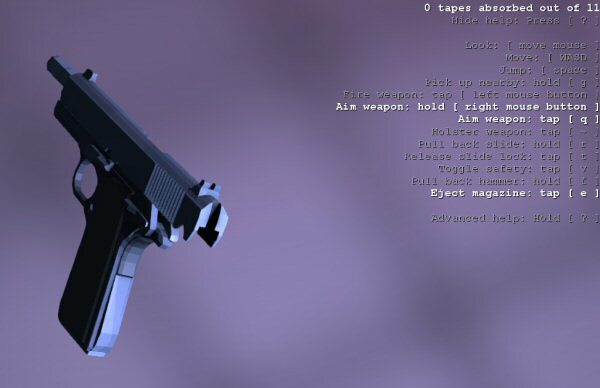 The developer, Wolfire, has gone to unprecedented detail in how the gun is handled and in doing so discovered something profound about our relationship with virtual tools – and, yes, especially our virtual guns. Instead of hitting “R” to reload a gun, you need to eject the magazine, hold it out, holster your weapon and insert bullets into the magazine one by one. Once done, you manually insert the magazine. After minutes of fumbling, you get pretty good at this. You’re going to be unnaturally fast, a virtual gunman, in no time, but it still feels like the real thing – like manipulating a magazine and preparing a gun for firing really feels like. They’ve managed to make a meaningful experience out of that most banal of all videogame activities; the reloading of the gun. Under stress, it’s very difficult indeed to recall how it was all done. Instead of pointing a cursor at a guy and clicking to kill it, your mouse moves your gun hand (if holding the gun in ready position). You align the target using the gun’s sights and pull the trigger, perhaps hitting your target. It’s often hard to tell if you’ve even hit as there’s a loud report and your gun is jerked upwards and you need to re-orient before firing again. Sometimes a bullet misfires and you have to clear it by pulling back the slide and checking the chamber. All this, too, gets fast with practice. Interesting things happen when so much attention is paid to operating the gun. It becomes a meaningful skill. You get enjoyment out of operating the firearm, much like you do in real life. You might argue this is a perverse enjoyment and I wouldn’t object, but it feels profoundly good to get good at something so core to many videogames, but on a much deeper level. Encountering a new gun is interesting as you want to see how it feels to operate it. The act of shooting becomes deliberate, not automatic. Even after you get good at the act, just because there’s so many steps to it and so much skill involved, you have an understanding of what you’re doing. The gun itself gains weight. You stop think about it in terms of gameplay value or statistics. Exactly as in real life, you start to think about it as a lethal tool designed to destroy whatever is in front of the barrel. Having the gun makes you feel powerful, but also somewhat scared of that power in your hands. Receiver makes you think about what else is so automatic in games, yet could be laden with meaning if more attention was paid to it. Receiver actually goes further than just the gun – running is simulated by pressing buttons alternatingly to pound the ground. It feels somewhat like running, unlike just pressing “W” does. (You can’t operate the gun while running.) Might a brawl be somehow simulated in real time using a more involved system than what you see in fighting games? Could sneaking be made more active and skill-based? What about talking? I would be very interested to see a more fully fleshed game made with this kind of gun manipulation. Learning to operate a gun in Receiver essentially prepares you for shooting a real gun and you could argue it would be a disturbing murder simulator and if they were humans you were shooting, I might agree. Regardless, something like Metro 2033, Stalker or Far Cry 2 would be very interesting with this logically extreme dedication to gun fetishism.